Here are a few ideas for those of you out there who have the patience to train shrubs, and for those with a sense of humor, I’ve included the last example. This is an amazing yew I found one day when I had to park and then walk to a nearby pharmacy for a special compounded medication for my swelling disease. To say the least, the charm of this bush dismissed my irksome mood concerning the steroids. It is simply an area most people would ignore, on the north side of an old auto dealership building, and this is what they’ve done with it. It still makes me smile. This little archway has amazed me for years. I first noticed it when we moved to the neighborhood almost 6 years ago. 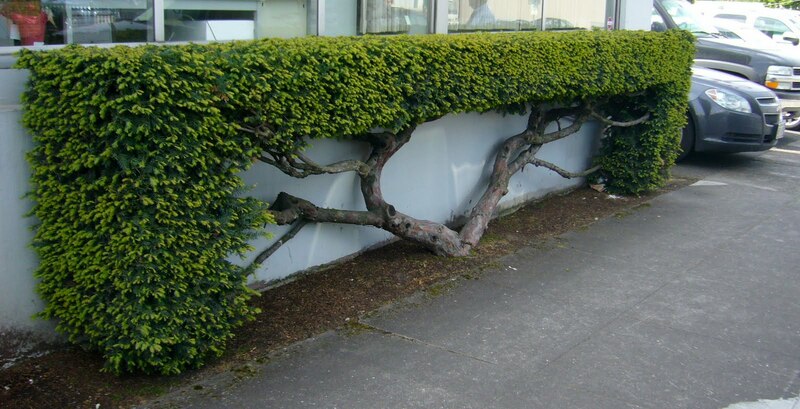 Again, this is a yew, but this time the front of the building is facing west so it gets more sun than the dealership. 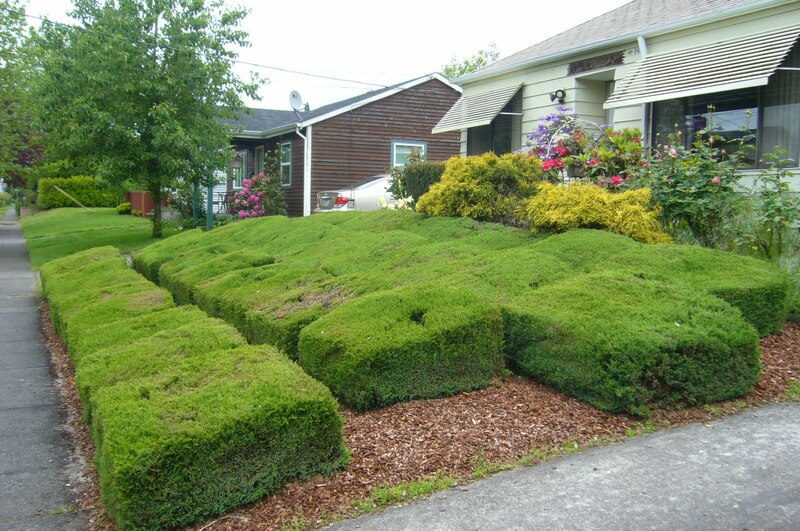 I have yews in my garden, and it is likely that I will do this with my narrow yews someday, but it will have to be added to that long list of things to do. Lucky for me they are still large enough for me to move with ease, and I’m young-ish. Yews do grow slowly. Lastly, there is this yard. It too is in the neighborhood and is down the block from the last one. Why would you do this, right!?! This has to be one of the lowest maintenance looks I have ever seen, except those trims probably take awhile. 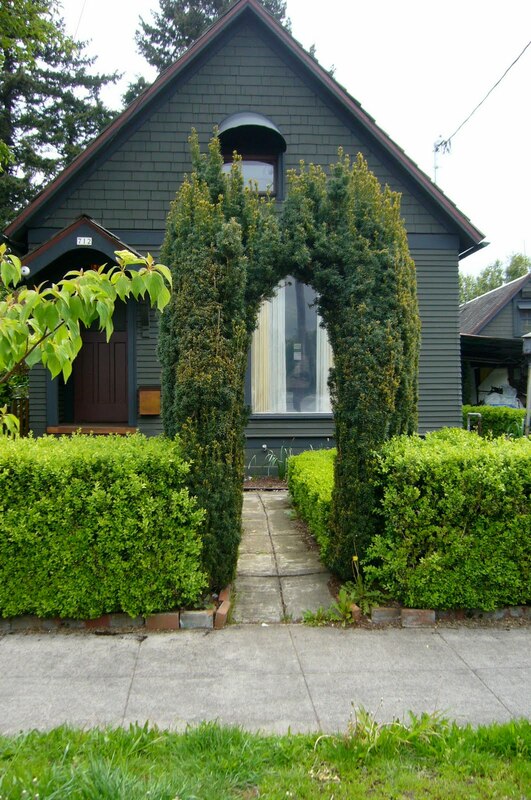 The shrubs are never allowed to grow together and are trimmed so that there is always space between the bushes. At least it’s drought tolerant. I love the top two pictures, very creative and interesting. Ummm… not so sure about the last one. Some obsessive compulsive behavior maybe? I don't get the squares either. Thanks for sharing the cool shapes. That first one is very cool! And the last one, I remember seeing that before, one of those days when I took a short cut through a residential neighborhood and wished I had my camera. Good catch! Those squares in the front yard seem like a lot of work for minimal visual pleasure! They look like rows of loaves of moldy bread. 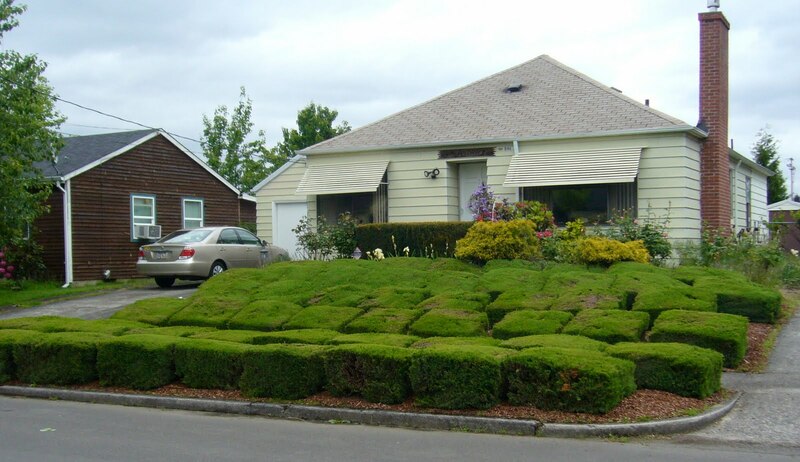 I love it when they trim shrubs into crazy shapes. Certainly better than just the rounded mounds that most of the houses around here have. Wonderfully odd! Thanks for sharing.